Mexico is the largest country of origin for immigrants in the United States, accounting for 29% of the foreign-born population in 2010.1 Most immigrants who leave Mexico come to the United States, and one-in-ten Mexican-born people currently lives in the U.S. There is great variation in the patterns of immigration among the nation’s 12 million Mexican-born immigrants. Many immigrants settle permanently and have children born in the United States. But a substantial number also travel back and forth across the border through the year, a pattern known as circular migration. There has long been a seasonal pattern to Mexican-U.S. migration, with larger numbers of people heading north in the spring and summer and larger numbers of people headed south in the fall and winter. This has abated somewhat, according to data from Mexico that indicate movement spread more evenly through the year (Pew Hispanic Center, 2011). Compared with other foreign-born residents of the U.S., Mexican-born immigrants are younger, less educated and less likely to speak English very well, according to tabulations from the 2010 American Community Survey. Only about a quarter (23%) are U.S. citizens, in large part because most Mexican immigrants are unauthorized and not eligible for citizenship; by comparison, a slight majority of immigrants from all other countries (52%) are citizens. Not withstanding the presence of unauthorized immigrants, legal Mexican immigrants have lower rates of naturalization than other immigrants (Passel 2007). About a third of Mexican immigrants (34%) arrived in the U.S. since 2000, similar to the share of all immigrants (35%). The share of Mexican immigrants who have lived in the U.S. for two decades or more (35%) is somewhat lower than the share of other immigrants of similar duration (40%). There are notable demographic differences between Mexican immigrants and those from other countries. Most immigrants from Mexico (54%) are men; most other immigrants (53%) are women. Mexican immigrants are younger than others: the median age of Mexican-born residents of the U.S. is 37, compared with 43 for other immigrants. Mexican-born immigrants on average are less educated than other immigrants. Among Mexican-born immigrants ages 25 and older, 60% have less than a high school education, compared with a fifth (21%) of other immigrants. Only 5% of the Mexican born hold a college degree, compared with more than a third (36%) of other immigrants. Economically, Mexican-born immigrants are not as well off as others. The median annual household income for Mexican-born immigrants is $35,000, compared with $51,500 for other immigrants. These lower incomes are a reflection of the group’s employment profile. Mexican-born immigrants are more likely than other immigrants to work in the construction, agriculture or mining industries (23% vs. 6%). Looking at occupation, only 10% of Mexican-born immigrants work in management, professional and related jobs, compared with 41% of immigrants from other countries. Mexican-born immigrants are somewhat less likely than other immigrants to be homeowners (46% of households, vs. 55%). They are also less likely than other immigrants to speak only English at home and more likely to say they do not speak English very well. Among Mexican immigrants ages 5 and older, 72% say they do not speak English very well. Among other immigrants, 43% say so. Most Mexican immigrants ages 15 and older (58%) are married, a share similar to that of other immigrants (59%). As might be expected, Mexican-born immigrants are concentrated in Western and Southern states. Half (51%) live in the West, and an additional third (33%) live in the South. A notably low share (4%) lives in the Northeast. By contrast, about equal numbers of other immigrants live in the West, South and Northeast. By state, well over half (58%) live in California (4.3 million) and Texas (2.5 million). That share has declined since 2000, when it was 63%, an indication of how Mexican-born immigrants have dispersed to other states. 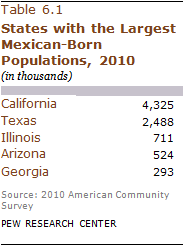 No other state has more than a million Mexican-born residents, however.